Baseball Hit and Run: The high pay off, low-risk play for your offense. Why should you add the baseball hit and run to your teams’ baseball basics? There are many reasons. To begin with lets look at the hit and run baseball play. The baseball hit & run play is usually used with a baserunner on first base or first and second base with less than two outs. Mostly used with one out. The baserunners break on the pitch similar to stealing. Except the runner makes sure to not get picked off by the pitcher. So, the base stealer does not get quite as good of ‘jump’ as they would on a straight steal. The batter has to make sure that the baseball bat hitting ball is a mandatory assignment. Since the runner does not always get their best base stealing jump the hitter must hit a baseball or at least swing at the pitch to protect the runner from getting thrown out. The baseball hit & run play is designed to get your baserunners to move into scoring position and possibly set the table for a big inning without using up an out by bunting. This is a high percentage baseball skill and shows players how to become a better baseball player. Let us continue looking at the high percentage baseball basics for the hit and run baseball plays. First, you want baseball hitters to swing the bat. 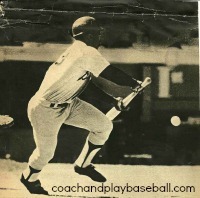 You cannot develop a proper baseball swing without swinging the bat. Teaching kids how hit a baseball is one of the most important baseball skills to keep kids playing baseball. Second, the percentage of catchers that can throw runners out at second base is very low until the high school baseball levels. So even if the batter swings and misses you are very likely going to steal the base anyway. Now you have a runner on second base and you have not given up an out by trying a bunt play. Third, with the baserunner on the move they will likely advance a couple of bases on a base hit and have a chance to score a run on an extra base hit. Fourth, if the hitter connects for a base hit and the baserunner advances to third base your baseball team has an opportunity for a big inning of two maybe three runs or more. 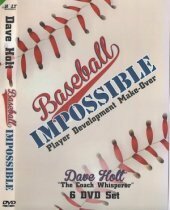 Fifth, in higher levels of baseball your team can avoid hitting into a double play. In the lower levels the double play is pretty rare though. Sixth, a slower baserunner that is not a high percentage base stealer can move into scoring position. That is why the hitting technique calls for the batter to swing at the pitch no matter where the pitch is so the batter can protect the slower runner from being thrown out at second base. Baseball bunting has to stop. Often youth baseball coaches believe they are really strategizing when they have their baseball players bunt. 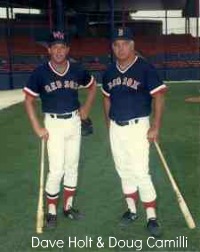 In reality, baseball coaches are harming player devleopment and professional baseball instruction by bunting too much. Bunting should be used sparingly and rarely. 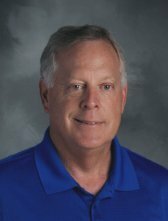 Maybe when the game is close in the last inning a bunt may be in order and that is usually at the high school baseball levels and above. 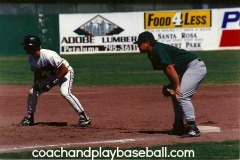 Do not give up an out on a sacrifice bunt when the hit and run baseball play or the steal is very effective. Teaching batting and the hitting skills will give a baseball player much more value and a longer baseball life span. Who do you think is going to stay in baseball the longest—a good bunter or a good hitter? There are not many bunters on the all-league team or in the Baseball Hall of Fame. Top baseball hitters should always practice bunting so they are ready to bunt when called on. But remember, baseball schools are looking for top baseball hitters so you are better served to spend your maximum time teaching kids to hit a baseball. Return to Hitting101 from Baseball hit and run. Return to Youth Baseball Home from Baseball Hit and Run.